I know the NRA thinks we should have a mandatory waiting period before we discuss guns after a gun related incident. But, those comments themselves have a political purpose to protect the status quo. The sad reality is if we want to do something about gun violence in this country, we need to expand the availability of mental health services and limit access of those who are mentally unstable from obtaining weapons. 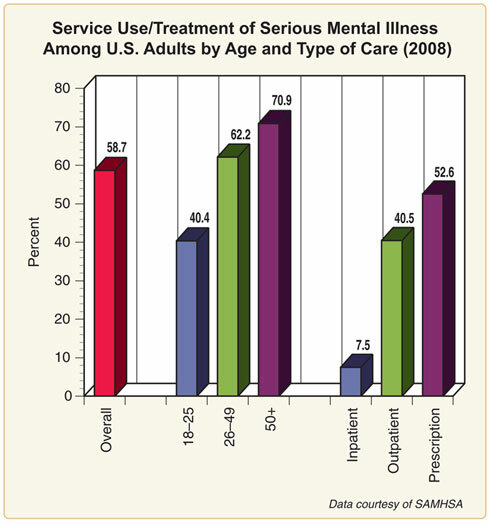 As this chart from the National Institute of Mental Health (NIMH) notes, only 40.2% of young adults age 18-25 with a serious mental illness received treatment in 2008. Plus, over 1/2 of those treatments consisted only of prescription drugs - not outpatient or inpatient services. If you are mentally ill, it is very hard to find services to help. It's much easier to find a gun. Gun dealers are ubiquitous in our society. 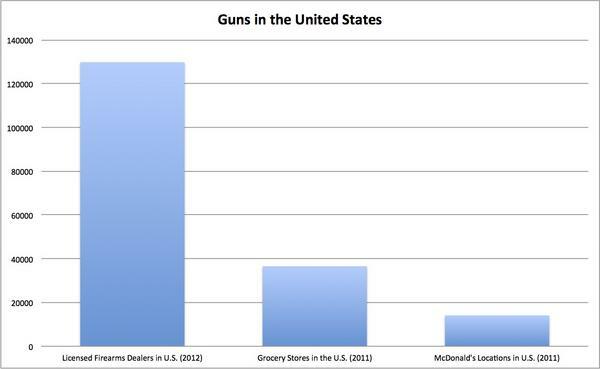 Just consider that there are 9x as many gun dealers in the United States as there are McDonalds locations -- 129,817 licensed gun dealers in the US compared to 14,098 McDonald’s restaurants. Meanwhile, mental health services are extremely lacking. HRSA reports as of Nov. 16, 2012 there are 89.3 million people living in Mental Health Professional Shortage Areas (HPSAs) in the United States. It would take 5,972 practitioners to meet their need for mental health providers (a population to practitioner ratio of 10,000:1). I don't expect the NRA to come out in support of expanded mental health services any time soon though. They are more interested in arming even more people to "address" the problem. We need to do something more effective to address this problem -- now. We can't afford to wait. I disagree with your assumption of the NRA not supporting mental health because "They are more interested in arming even more people to "address" the problem." I think it is an outrageous comment to lead people to think they provide guns to "address the problem!" What is YOUR solution? If you cannot offer a solution, then don't bother blogging. Your East Tennessee roots should be able to offer up some sort of reason,that is lack of education. Guns did not kill the Conn children, a sick person did. Supporting mental health services would be ideal for the NRA and I wouldn't doubt if we don't see that at some point.